Prototype of printed circuit board Callisto based on NXP tuner CD1316L/IHP-3. The original tuner CD1316L/IV is no longer available. Unfortunately also the firmware in RISC-processor ATmega16 had to be adapted. 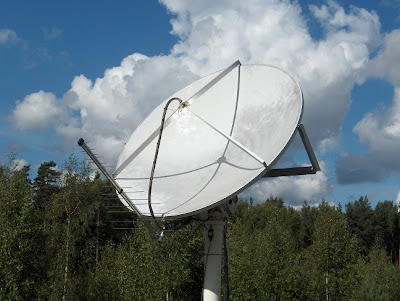 The logarithmic periodic antenna (DBV-T) is attached to the rim of a microwave telescope dish that observes the solar radio flux at 11 GHz. Picture taken by Juha Kallunki MRO.